Life is reasonably rosy for plus-size ex-pop star turned Assistant Dormitory Director and sometime sleuth Heather Wells. Her freeloading ex-con dad is finally moving out. She still yearns for her hot landlord, Cooper Cartwright, but her relationship with 'rebound beau', vigorous vegan math professor Tad Tocco, is more than satisfactory. Best of all, nobody has died lately in 'Death Dorm', the aptly nicknamed student residence that Heather assistant-directs. Of course, every silver lining ultimately has some black cloud attached. And when the latest murdered corpse to clutter up her jurisdiction turns out to be her exceedingly unlovable boss, Heather finds herself on the shortlist of prime suspects along with the rabble-rousing boyfriend of her high-strung student assistant and an indecently handsome young campus minister who's been accused of taking liberties with certain girls' choir members. 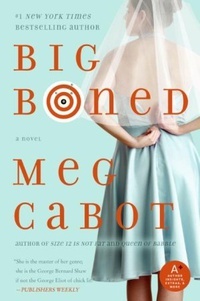 Meg Cabot já morou em Indiana, Califórnia, e na França. Trabalhou como ilustradora e usou um pseudônimo para escrever romances históricos. É autora de 'O diário da princesa' e de 'A princesa sob os refletores', ambos publicados pela editora Record.